my Ink well: Peace, Love and Totally Cool! Peace, Love and Totally Cool! CAS-ual Fridays challenge this week is to use 2 circles on your project. I just bought this fun Peace Signs set from Inkadinkado, and decided that my circle design would incorporate one of those images. I also got a big stash of Paper Smooches fun recently, so I was bound and determined to work some of those in too. Well, I see my 2 circles as the two gray circles, but then there are all of the embossed circles and the white circle and the peace sign circle... nonetheless, I like the way this finally came out. 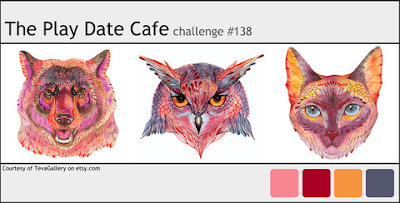 My color scheme is taken from this week's Play Date Cafe color story challenge. Thanks so much for stopping in today. Be well. Weather is crazy all over the place here in the US. We just have extrememly hot and humid conditions here in the northeast. This really is totally cool. 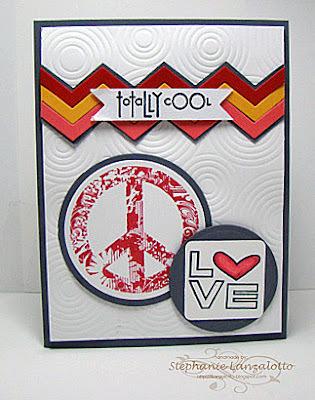 I love how you have combined peace and love on this card. I think I will get that stamp set. It looks very fun. Commission for you! Oh, I don't know about this...there are a few more than two circles!!?? OK...I love it...I simply cannot pull off that fun, funky style - that you have done so well on this card! You've combined two of my favorite things on this fabulous card...chevron and circles!! I just LOVE that circle embossed BG and the chevron next to it! Wow!!! totally cool, Stephanie! Love the cheveron and the texture on the background. Thanks for playing with us @CAS-ual Fridays!